When he was sworn in as West Linn mayor in 2015, Russ Axelrod hoped to turn the city's gaze outward. He wanted to foster regional partnerships that would improve West Linn and the Portland area at large, leaving behind the infighting and dysfunction that had hampered those efforts in the past. 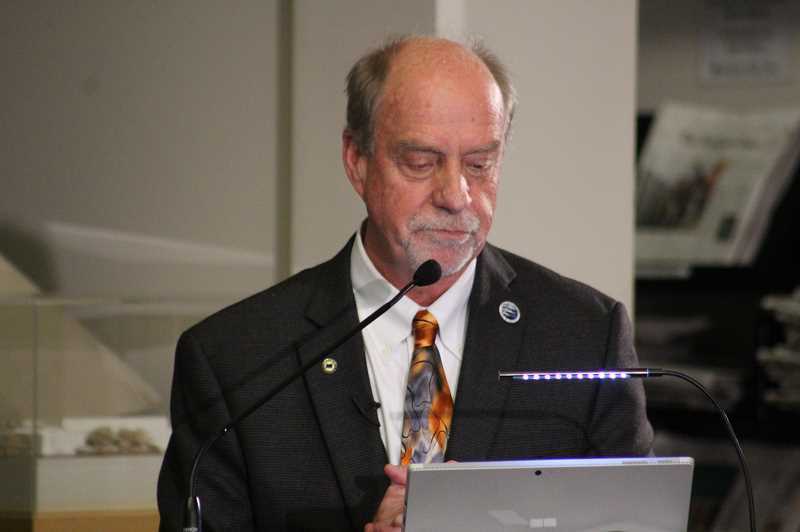 Some of that intra-council turmoil has continued, but at his annual State of the City address Feb. 28 at the West Linn Public Library, Axelrod said West Linn's reach continues to grow well beyond city limits. "The last couple years I've mentioned how our city is reaching out like never before to our neighboring cities and regional stakeholders," Axelrod said. "This embraces an approach to strengthen our positions and opportunities that serve our own needs, but also one that helps us create a better urban setting with our neighbors that we increasingly share attributes with ... I believe that our city is already so much stronger and better equipped for this now in 2019 than when I first came on council in 2015." Axelrod took pains to acknowledge City staff's accomplishments throughout the speech, highlighting milestones in each department ranging from the passing of a $19 million general obligation (GO) bond last year to the hiring of a new police chief and the installation of new sports fields at city parks. Yet even with that bond money in hand to fund a number of significant projects around the city, Axelrod said West Linn would face significant budget challenges this year. "In 2019, perhaps our biggest goal will be to prepare a balanced budget for the next biennium," he said. "Our fixed low tax rate with ever-increasing costs and community desires will require taking a close look at areas where the City can reduce expenses and increase revenues to maintain a balanced budget and sustainable future — while retaining the core services and values we all appreciate in West Linn." As for other 2019 priorities, Axelrod said the City Council is still finalizing its list of goals but that it would likely include items related to the GO bond, transportation planning, waterfront redevelopment exploration and emergency preparedness initiatives. "These themes are broadly conceptual and will likely be refined, and some potentially even set aside or changed as we learn more about our budget capacity this spring," Axelrod said. He also highlighted recent progress made to repurpose the old city hall building and reopening the Willamette Falls Locks. On the former, Axelrod said the City was excited to partner with the Willamette Falls Heritage Area Coalition, Willamette Falls Heritage Foundation and several other nonprofits to create a new cultural center. "A highly qualified architect is overseeing the work, and this location is envisioned to become the gateway to tourism and heritage activities in and around the Willamette Falls," Axelrod said. As for the locks, Axelrod currently serves as the chair of the Willamette Falls Locks Commission, and he expressed confidence that they would reopen soon. "This will open a flood of opportunities for expanded river access and uses supporting recreation, tourism, commercial transport, local port development, resiliency and valued economic development along our Willamette River," he said.